The starting gun has fired and the GMs are out of the starting blocks for “Free Agent Frenzy” 2012. The big names have yet to ink deals, but speculation is running rampant as to which teams are involved in the conversations. 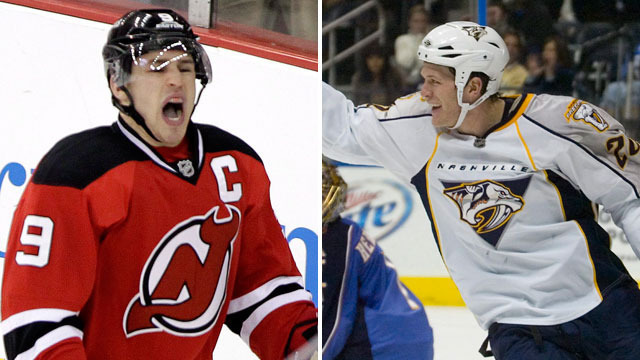 Word on the street is that the Philadelphia Flyers, Ottawa Senators and Carolina Hurricanes have jumped into the pool of teams gunning for Zach Parise and Ryan Suter, joining the likes of the Penguins, Red Wings and Wild. It is probably safe to say that there are more teams interested in these two players than teams who are not at this point. It is worth noting that the Red Wings and Penguins have opted not to head up to Toronto for a face-to-face meeting with Parise and his agent, so any negotiating or selling that they do will be done from afar. Rob Rossi of the Pittsburgh Tribune Review and other league sources have confirmed that the Penguins pitch to Parise has reportedly involved personal calls from both the newly signed Sidney Crosby and fellow Minnesota native Paul Martin. It does appear as if there is a full court press on for Parise. The day has been highlighted by a number of lesser deals to this point. Some of the highlights include Jonas Gustavsson to the Red Wings to back-up Jimmy Howard, Guillaume Latendresse to the Ottawa Senators, Ray Whitney heads to the Stars, Ryan Smyth stays in Edmonton, and Zenon Konopka heads to Minnesota. One of the more interesting moves, at least as far as many Penguins fans were concerned, is Colby Armstrong heading to Montreal. Many folks in and around the confluence were clamoring for a return of Armstrong, who has played just 79 games over the past two seasons due to injuries. The collective thinking in the hockey world seems to point to the fact that the big fish will not sign today, as they are being courted by a number of suitors. You may recall that the Brad Richards saga dragged on for a handful of days last season before he ultimately inked with the New York Rangers. If the Penguins fail to land one or both of Parise/Suter, they do have contingencies in free agency and via trade, so do not get discouraged in the process. It should be a fun couple of days watching as this plays out.